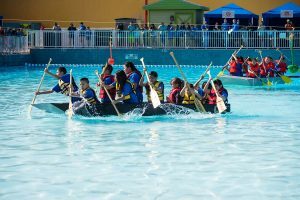 The Cardboard Boat Regatta is one of four fundraising events throughout the year that support environmental education at River Legacy Living Science Center & River Legacy Parks. Check out Photos from our 2019 Cardboard Boat Regatta! A huge thanks to all of our sponsors, boat crews, volunteers and attendees for braving the cold and rain AND for coming back for DAY 2 for our 30th annual Cardboard Boat Regatta! We are already looking forward to next year! The Cardboard Boat Regatta challenges amateur boat builders – youth and adult – to design, build and navigate boats made entirely of corrugated cardboard. The crafty cardboard creations then sail (or sink!) in Hurricane Harbor’s Wave Pool as they compete for a variety of trophies. Spectators have just as much fun cheering on the courageous crews and soaking up the event-day activities. We are so excited to announce that guests can enjoy live music in the Splashwater Beach section of Hurricane Harbor, just behind the Wave Pool race action. Splashwater Beach also features a variety of fun interactive water elements to enjoy while listening to musical acts from Young Stars & Guitars and Arlington’s own Luke Chacko. This year, Hurricane Harbor rides or Hook’s Lagoon will not be available. Download a Boat Building Manual to take you step by step through the process. These boat entries can also include our Class II mechanical boats, which use muscle-powered propulsion systems (propellers, paddle wheels, sails) and steering systems (rudders) that do not need to be made of cardboard. In celebration of the Regatta’s 30th anniversary, teams that incorporate the 30th anniversary into the design or spirit cheer of their boat will receive extra points for the Rah, Rah Award! SOLD OUT – Boat Kits – NEW! Thanks to our generous sponsor, Harris Packaging, participants can pre-purchase a pre-cut boat kit that all you have to do is assemble, paint and decorate to make it your own theme! Boat kits can be designed for 4 to 6 crew members. Limited supply of 10 kits available, on a first-come, first-served basis. Boat kits can be picked up from Harris Packaging by appointment on Saturdays. Order your boat kits on the entry forms, or contact Kristi Payne via e-mail or 817.860.6752, ext. 107. All high schools that enter a boat in one or more categories in the Cardboard Boat Regatta are automatically entered in the High School Challenge! Show your school spirit to win the Rah!Rah! Award! Win the High School Challenge Trophy! Race a small pinewood sailboat along a rain gutter by blowing into the sail. Pinewood sailboat kits can be purchased at Acorns Gift Shop inside River Legacy Living Science Center and built and decorated before event day. SAVE A WHALE & WIN A PRIZE! Win fabulous prizes – SmartTV; FitBit Versas; Hurricane Harbor Admission Tickets; Pontoon Boat Rental; Retail & Restaurant Gift Cards; Entertainment Packages; AND SO MUCH MORE! Download the Whale Sail form to save your winning whales NOW! Do not have to be present to win. 2019 Registration Waiver – Download and return the waiver to participate in all events. Public school participants (elementary-high school) can receive 5 FREE sheets of cardboard per boat entry. Download Cardboard Pick Up Location & Dates Here – Cardboard will only be available on the dates listed. Schools & Groups can feed their hungry crew by pre-ordering pizzas for just $9 to be picked up at a Concession Area at Regatta. Download a Pizza Pre-Order Form Here. Deadline to order pizzas is Thursday, April 4. (Please note: No outside food or coolers are allowed inside Hurricane Harbor). Please consider all event fees a donation to River Legacy Foundation in case of event cancellation due to inclement weather. No refunds will be provided. To consider a Corporate Sponsorship of Cardboard Boat Regatta, contact Fund Development Coordinator Becky Nussbaum at 817.860.6752, ext. 120. For more information about event activities and registration, contact Marketing Coordinator Kristi Payne at 817.860.6752, ext. 107. For information about volunteering at Cardboard Boat Regatta, contact Volunteer Manager Breanna Sayers at 817.860.6752, ext. 109. Thank you for supporting our 2019 Cardboard Boat Regatta Sponsors!